These precious and very soft bunnies were given to my children when they were born. Our kids have slept with them and loved on them for many years. I decided to offer these bunnies from North American Bear Company(tm) so that Brooke's Line friends could enjoy them as well. They are 15 inches tall, made of velboa and wear an attached pink or blue striped jersey union suit and matching hat. The bunnies have won the Oppenheim Toy Portfolio Gold Seal Award. 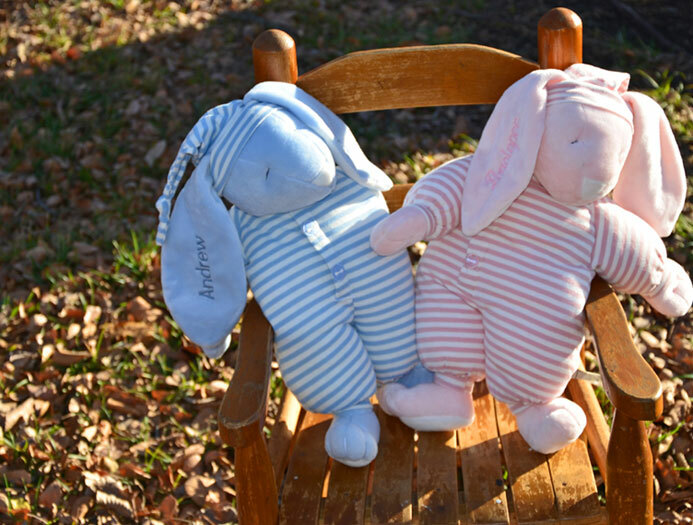 We think they're real winners when a monogram is added to each bunny ear making them a keepsake with the child's name and birth date. Personalize your gift with custom monogramming of the child's first name, birth date or both! If you have any questions about this site or need help with ordering, you can call us at 972-359-2896 or e-mail us.